I am sick and tired of hearing that it's not MY holiday! I admit it, Christmas is a big thing in our family. I loved it as a kid, I still love it today. Delicious cookies, candles, lights, time for the family and traditional “Gemütlichkeit” – what is not to love about this? But if you’ve ever been on social media around the winter holidays, you know all about the so called “war on christmas” and that only Jesus is the “reason for the season”. 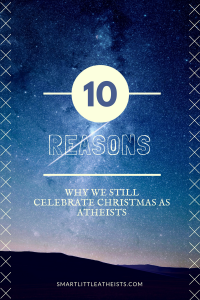 So, we don’t belive in God, Jesus, the virgin birth and all that goes with it – why do we celebrate? It was a pagan holiday first. It has been discussed so many times, I don’t think I even have to say it anymore. Most of our “Christmas”-traditions have been around longer than the church. People have always marked the solstices by celebrating! Why should we NOT celebrate? No one will punish us for our blasphemic behaviour because the existence of god is so unlikely that it can be dismissed without further thought. I even watch the Country christmas special. Austria is a very catholic country. Christmas is basically unavoidable here. Even if we locked our kids up for the month of devember, we then would have to shut out the electronic part of the world, too. Every Computergame, every app will have a holiday special. Every movie, every TV show has a holiday episode. I do not want to keep my kids from that big a part of our culture. My kids may not get to sing in church at night (a tradition my mom and I had for many years), but there are many things that connect them to their grand parents and even thir great-grand parents. We eat fried fish and potato salad on christmas eve (austrian tradition), as their dad has done with his parents when he was young. His parents both did that as kids with their parents, too – so our three little monsters are connected to their ancestors. And this, most of all, is always worth all the efford. Dad takes the kids out to an indoor playground on december 24th and I get the day to decorate the tree, and make food. When they come back, the door to the living room is closed and will only open after dinner. So we eat dinner (the aforementioned fish and potato salad) fairly early. I go in and light the tree (real candles only on christmas eve – I dont want to light them later, when the tree is dryer) and ring a little bell. When they come in, their eyes are shining. So we will continue to celebrate christmas.And enjoy it. And Stop apologizing for it. How about you? Do you celebrate christmas, even if it isn’t part of your religion? Homeschooling – not just for religious nutjobs!